Sources: Russian Transport Clearing House, Federal Air Transport Agency. * The figures are for the total number of passengers carried in both directions within each city pair. The “from-to” directions given in the table had the higher number of passengers carried in 2016. Because of the economic slowdown, the number of Russian commercial airlines decreased from 389 companies registered in 1996 to 113 in 2016. This dramatic reduction is a direct reflection of market consolidation and the government’s policy to raise barriers for new players entering the air transport market. The airline assets controlled by the federal government are merged into the Aeroflot Group. Other local carriers are either privately owned or controlled by regional authorities. After the demise in late 2015 of Transaero, Russia’s second largest airline, the local market has been dominated principally by the Aeroflot Group and several other large players comprising S7 Group (which includes S7 Airlines and Globus), as well as UTair and Ural Airlines. 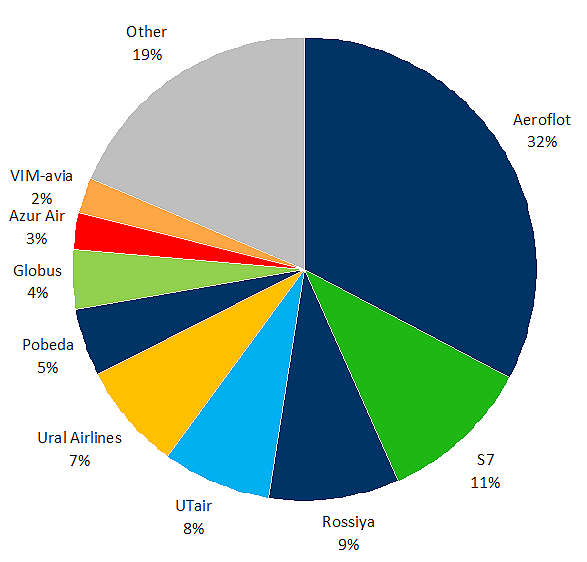 Currently, the top-10 Russian airlines control 80% of the Russian market (see the diagram below), whilst foreign airlines carried less than 10 per cent of overall passenger numbers – or 28% of passengers on international routes to/from Russia in 2015. 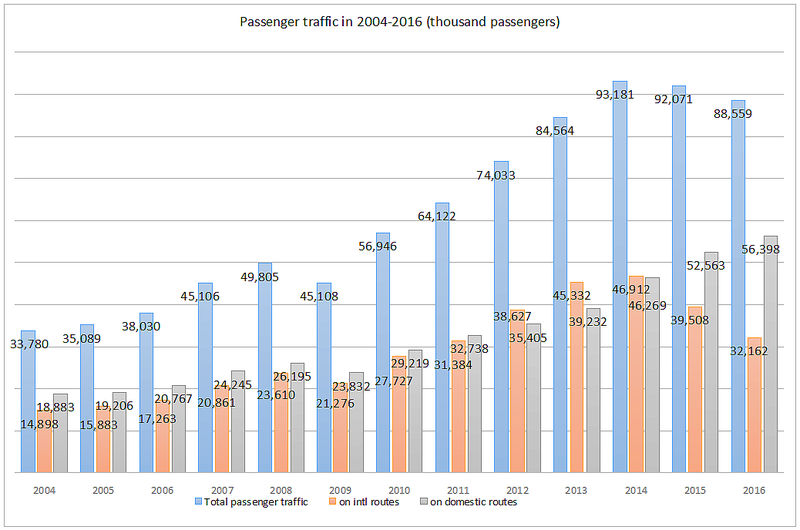 Russian airlines statistics section contains detailed data on the number of passengers carried, passenger kilometers accomplished and passenger load factors for the leading Russian airlines between 2005 and 2016. Provided below is the list of major airlines by passengers carried on international and domestic routes in 2016. Each airline profile contains information on the base airports, fleet, number of passengers carried (YOY since 2005), contacts and list of articles. As of the beginning of 2016, Russia had 254 civil airfields and heliports, including 74 operating international airports. Of this total, 178 airports have paved runways, 76 are unpaved. 31 are certified for ICAO Cat I landings, 10 more for Cat II landings and only three – Moscow’s Sheremetyevo, Domodedovo and Vnukovo – for Cat III landing capabilities. Provided below is the list of major Russian international airports by passengers served in 2016. Each airport profile contains general information on the airport, data on runways, approved aircraft types, number of passengers served (YOY since 2005), contacts and list of articles. Russian airports statistics section contains detailed data on the number of passengers and freight tonnages carried through Russia’s top airports between 2005 and 2016.